I will be doing the funeral tomorrow. I don't necessarily 'like' to do funerals but this one is different. I only had the privilege of knowing him for about 10 days but in that short time I knew exactly where his heart was. He was a man of God. He was a pleasant man despite what his time 'outside' the will of God had done to his body. Because of this particular 'season' in my friend's life, I've been thinking and meditating on Ecclesiastes 3:1-8. 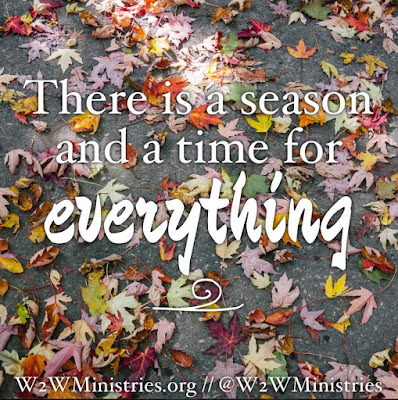 We all have seasons in our life. Those seasons are normal. There is an appointed time for everything that we go through. No one likes to deal with the death of a loved one...but it is a season...for us and for the departed one. Should the Lord tarry, we will all experience that season. For each positive season, there is a negative one. A time to be born (positive) and a time to die (negative). A time to kill (negative) and a time to heal (positive). You get my drift. So, my friend, if you are currently in a positive season, enjoy it, embrace it because as sure as the sun will rise tomorrow a negative season will come. But remember this...when the negative season does come, a positive time will follow. See it's a cycle...you won't get stuck in a negative season...positive will come. Don't get discouraged in the negative. Just remember...there is a time for every activity under heaven. Have a blessed day, no matter your season!! Great post. Some seasons are so hard. Thankfully He's there every step of the way.